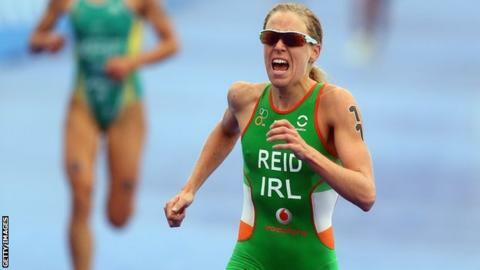 Aileen Reid ended her season on an impressive note as she finished fifth in the World Triathlon Series's concluding Grand Final event in Edmonton in Canada. Derry woman Reid produced a storming run to move up from 20th place at the end of the first lap of the 10km. At the finish, the 32-year-old was one minute and 16 seconds behind winner and new World Champion Gwen Jorgensen. Reid's performance left her eighth overall in this year's World Series. American Jorgensen finished ahead of New Zealanders Andrea Hewitt and Nicky Samuels in Saturday's race. Jorgensen, who produced another dominant running performance in Canada, was clinching her fifth victory of this year's series. After her start to the season was affected by injury, Reid produced impressive form in the concluding months of the summer as she took eighth, ninth and 11th and fifth spots in her final four events in London, Hamburg, Stockholm and Edmonton. Reid also finished a solid sixth at the recent Commonwealth Games in Glasgow. The Londonderry woman took second in last year's Grand Final in London but still should be pleased by her efforts in Canada. Those behind Reid included Commonwealth champion Jodie Stimpson who was 13th. Jorgensen took the world title ahead of her compatriot Sarah Groff with New Zealander Hewitt third and Stimpson in fourth.